Creative hub Metro Arts has proposed a refurbishment to its heritage-listed CBD venue located at 109 Edward Street, Brisbane City. 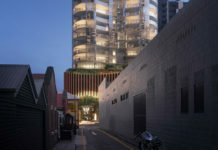 The non-profit organisation which provides adaptable artist studios, rehearsal and theatre spaces will undergo a two staged development to modernise facilities as well as activate a laneway and area at the rear of the building. 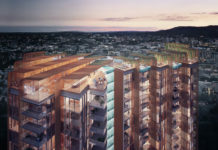 The development is intended to activate the currently underutilised laneway from Edward Street and the area behind the Metro Arts theatre building. It is proposed to undertake the development in two stages. Stage one will include the works associated with the new theatre foyer and bar as well as a single level of food and drink outlets at the rear of the building. All partial demolition works will occur as part of Stage one. Stage two will involve a second level of food and drink outlets at the rear of the building. The ‘front of house’ bar, foyer and laneway have been designed by Blight Rayner, while the ‘back of house’ area at the rear of the Metro Arts theatre building has been designed by Jasper Brown Architects. The DA number for this development is A004635558.